An 1850 image of Governor Winthrop’s landing at Salem in 1630. 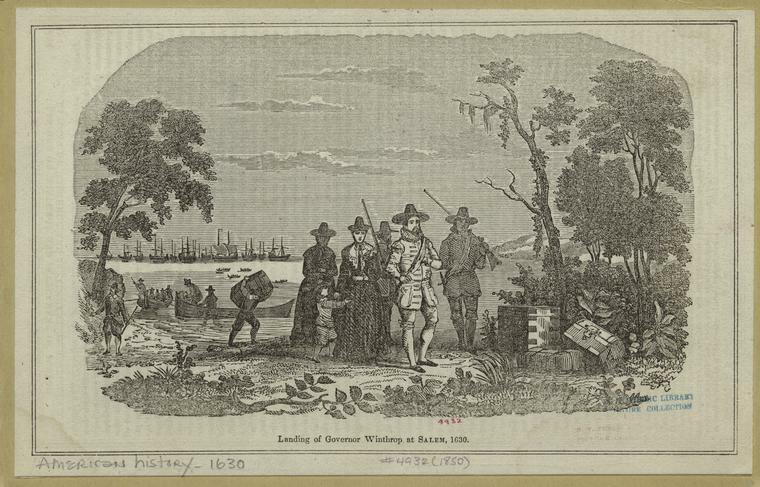 “Landing of Governor Wintrop at Salem, 1630,” Digital Public Library of America, http://dp.la/item/b70cb636b053e2d46e44781128726b0d. A photograph from the set of the silent movie The Scarlet Letter, 1926. A portrait of Jean Lander as Hester Prynne and “Little Mabel” Struthers as Pearl on the set of the play The Scarlet Letter in 1877. A 1965 oil painting by John Paul Jones inspired by a quotation from The Scarlet Letter. A photograph of Nathaniel Hawthorne. A copy of The Scarlet Letter with a hand-painted celluloid cover. Excerpts (the opening scene and final scene) from a dramatic poem written for an opera of The Scarlet Letter, 1894. A model of the ship Arabella, on which over 700 Puritans sailed with livestock and provisions from England to New England in summer 1630. An 1858 image of John Elliot, the first missionary among Indians. An 1856 image of a Puritan man with Native Americans. A 1957 photograph of a reconstruction of a seventeenth-century Massachusetts Bay Colony home. A 1928 historical map that shows Shawmut or Boston from 1630-1930. A framed and embroidered medallion quilt owned by the White family of Westminster/Boston, 1785-1800. An excerpt from Jonathan Edwards’s sermon “Sinners in the Hands of an Angry God,” which he preached on July 7, 1741 in Enfield, Connecticut. An excerpt from Every Day Life in the Massachusetts Bay Colony by George Francis Dow, 1935.